Whether you have a toddler or a school going kid, mothers always find it hard to feed their little ones. It's the most tiring and taxing part of their everyday routine. Often we can find mothers running after their kids with a food plate in hand. And it becomes all the more troublesome when your baby has recently started exploring the world of food. 1. Fix a time: It would be better if you can fix some meal routine, at least for a fortnight. Offer fruits, snacks or any other meal at a fix time. This will help your baby come in terms with regular eating. Also, he will learn as to what to expect when. Slowly, he will adjust to the time as set for the meal time. 2. Allot a fixed place: Most of the mothers feed their toddlers by taking them out in the open, all the while showing them a bird, flower or any other interesting object so as to make them eat everything that's there on the plate. Though it's a good idea to connect the baby with the outside world, but in due course, this can turn the baby into a fussy eater. It would be far better if the baby is given a fixed place to have his meal. Give him a nice chair, sitting on which he can enjoy his meal. Try and put the baby on the chair whenever you feed him. This will make the baby understand that meals need to be had at fixed times and that too in peace. However, there is no harm in stepping out once in a while. 3. Engage in creative story weaving: If you thought that feeding the baby while keeping the TV turned on is a great idea, then you are slightly mistaken. Though TV will keep the baby's attention occupied but it does no good to his creativity. Rather, you must try and weave some interesting story according to the food you are feeding. For instance, if it's a mashed apple; tell the baby about its color, the texture etc. You can even sing some nice lullabies. This way your baby won't just eat the meal but even learn a few good things. 4. Bring in a variation: How would you feel if you are served with a bottle-gourd soup everyday? Of course, you won't appreciate that. Similarly, babies will also become fussy if you offer them the same kind of food every time. Bring in some variation, so as to keep his interest in food alive. If you give him mashed banana in the morning, for afternoon, stick to a pear or any other seasonal fruit. Variety can always encourage babies to to enjoy their meal time. 5. Family meals: This would work fine when your baby is around two years old. Having meals together will let the baby learn the right way of treating food and completing everything that's there on his plate. Eating meals together also helps in strengthening your bond. 6. Encourage Self-feeding: As the babies grow a little older, they develop a fancy of feeding themselves on their own. They would often make an effort to grab the spoon from your hand and eat on their own. This can call for a mess but don't stop your baby from making such an effort. Encourage self-feeding. This will help in enhancing the hand to mouth co-ordination and also develop a connection with the food. 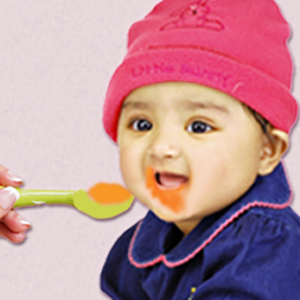 Your baby will gorge on the food happily and would eat to his content. 7. Colorful Setting: Babies would get attracted towards the food if it's served in some attractive dishes. Pick some bright colored spoons, cups, and tiny bowls. This will surely add some fun element to your baby's meal time. You can try out a number of ways to make your baby eat with interest and fun. Don't always lure him with toys or any other attractive object. Make the meal time fun using your own creativity!